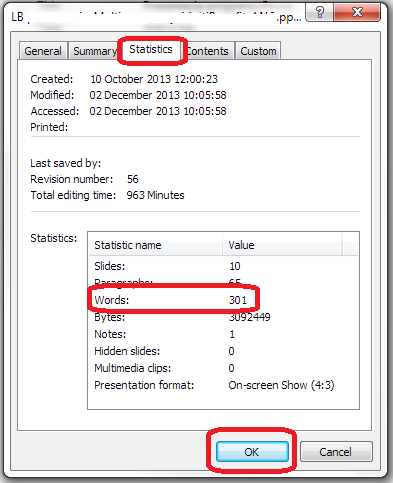 ← How do I count the words in a PowerPoint 2010 presentation? How do I count the words in a PowerPoint 2013 presentation? Some time ago, I published what has turned into a pretty popular post on how to count the words in your PowerPoint 2007 document. This is something that is a little tricky to find, so perfect for one of these how-to posts. Why would I want to count the words in a presentation? You might have a word limit imposed by a course tutor, or, more likely, you’re an editor with a per-word rate who needs to check how many words you’ve actually edited. This is, dare I say it, a little easier than in PowerPoint 2007. Once you’ve clicked on Advanced Properties, you’re given a list of properties. Click on the Statistics tab at the top and you’ll find your Word Count, among other information. 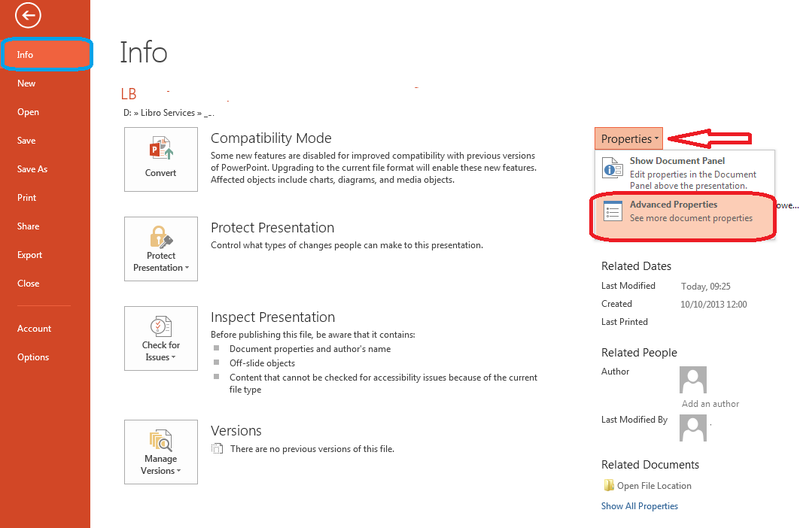 To return to your document, click OK and then back to the Home tab in your document. Please see the post on PowerPoint 2010. How do I count the number of words in a PowerPoint 2007 presentation? (this is a little different). If you’ve enjoyed this post or found it useful, please do comment, or share using the buttons below! Thank you! Please note, these hints work with versions of Microsoft Office currently in use – Office 2007, Office 2010 and Office 2013, all for PC. Mac compatible versions of Word should have similar options. Always save a copy of your document before manipulating it. I bear no responsibility for any pickles you might get yourself into! I still use Ppt 2003, and there I (temporarily) eliminate the comments at the bottom of each slide, and go to Statistics under Properties in the File tab and see the Word count under Words. Fantastic help! Thank you very much. You’re welcome: glad I could help! Brilliant – thank you for the link!